From her picking style to her unlikely path to fame, the folk music heroine from Carrboro always did things her own way. Libba Cotten taught herself to play guitar on a dirt street in what is now Carrboro, along the railroad tracks where she could hear the whistle from the trains. 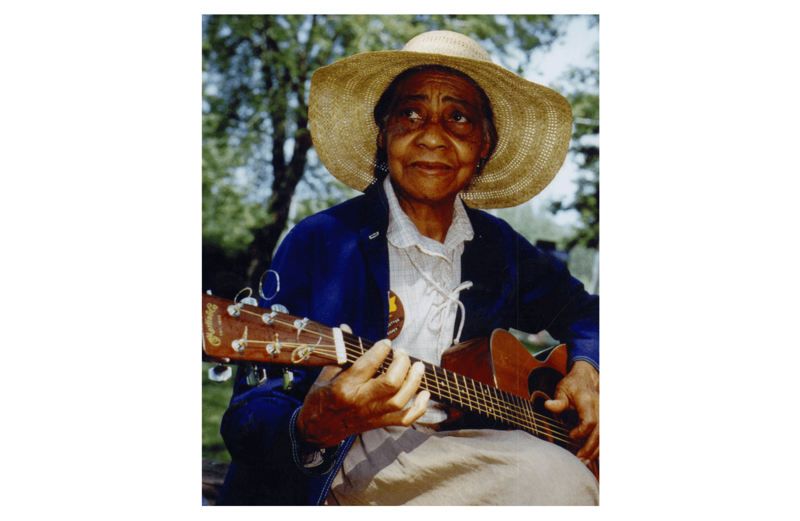 She bought the guitar with the money she made cooking and cleaning around Lloyd Street, where she also chopped wood and carried water, earning 75 cents, and later a dollar, a month. She was only a girl when she lived on Lloyd Street at the turn of the 20th century, the time of Jim Crow. But the songs she wrote there would carry her far away, all the way to the stage at Carnegie Hall, where the world heard her sing about the lonely sound of a passing train. Sources vary, but Elizabeth “Libba” Cotten would be around 119 if she were alive today, and if she could revisit the spot where she wrote “Freight Train,” she’d see her name printed across a tall historical marker, recognizing her as a “key figure” in the 1960s folk revival. Late in her life, Cotten found recognition she couldn’t have dreamed of as an 8-year-old girl, roughly her age when she started picking a guitar. No less a songwriter than Bob Dylan performed her “Shake Sugaree,” and the Grateful Dead played Cotten’s “Oh Babe, It Ain’t No Lie” onstage in Amsterdam. Cotten herself would play the Newport Folk Festival in 1964, a bill that also included Joan Baez and Mavis Staples. But her fame springs from the streets just outside Chapel Hill, where the town of Carrboro still celebrates her life, with the historical marker and a trail named for her. Cotten married at age 15 and more or less traded the guitar for family life, so the world very nearly missed hearing her. She found her way to millions of ears only by happy accident: One day in the late 1940s, folk music specialist Ruth Crawford Seeger lost track of her young daughter, Peggy, in the Washington, D.C., store where Cotten worked. Cotten found Peggy and returned her to her mother. She ended up babysitting for the Seegers, and it was Peggy who discovered Cotten’s talent and told the rest of the family about it. Cotten would hardly recognize her old hometown, which wasn’t incorporated and named Carrboro until she was 18. The way the town looks today, with its bead store and yoga studios, might confuse a girl raised chopping wood. But she’d still see the train tracks she watched as a young girl, dreaming of how they might one day carry her away. Shaffer is a reporter and columnist for the Raleigh News & Observer. He won first place in 2008 for general features from the American Association of Sunday and Features Editors.